After facing mounting pressure to crack down on controversial content on its Steam gaming platform, Valve has announced that any and all content not deemed to be “illegal, or straight up trolling” will continue to be carried on the platform. This comes days after Valve was pressured to remove first-person-shooter sim Active Shooter, a game that caused uproar for putting players in the shoes of a high school shooter. Valve’s new guidelines have sparked a predictable backlash for shirking responsibility for the content it carries. Comments on Steam’s own blog post, ‘Who Gets To Be On The Steam Store?’, seem largely supportive of the decision, seeing it as a stand against censorship of indie creators. One user named ‘go1orange’ simply said: “Thank you for letting me decide what games i [sic] want to play”. Despite the negative media coverage this decision will no doubt continue to incur, Steam has something of a monopoly on the PC gaming market. 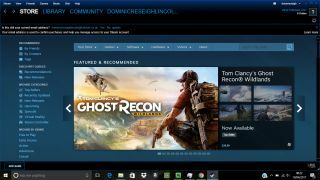 The online platform dominates the sale and distribution of PC games, listing over 24,000 titles at the time of writing. While alternatives to Steam exist – Origin or Humble Bumble come to mind – none offer the same scope or enjoy the level of user or developer engagement as Valve’s platform. Steam is hugely profitable for the company, and we’re sure Valve will be closely monitoring whether its hands-off approach is damaging in the long term.